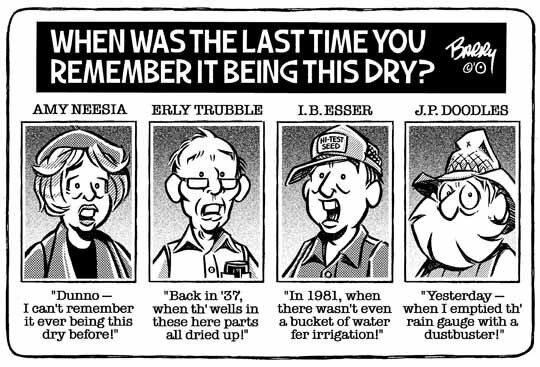 While I'm at it — here's a second DROUGHT cartoon. This one not only features a decided lack of moisture, but it's featured from a tourista POV. And we all know the mixed blessings of tourism, eh? HA! Sometimes, in this daze of manic Category building, I daydream about a year from now — when none of you will have topics to request, since they'll all answered onboard my NEW Site in their appropriate categories. Only, a large part of me duly confesses that I will miss the covering of your needs personally. But then — what help will I be from a white-sand beach on some South Pacific atoll while eyeing hula girls, eh? HA! I wish it were so. Truth being, I have another two or three years of cartoon uploading ahead of me before I can rest under those distant, swaying palms. Besides — I'm now living in my best of possible worlds. Back to reality. Hope this toon works for you. A "LAKE" version will appear in the DROUGHT Category ASAP. Keep grinnin' — it's our last best hope!